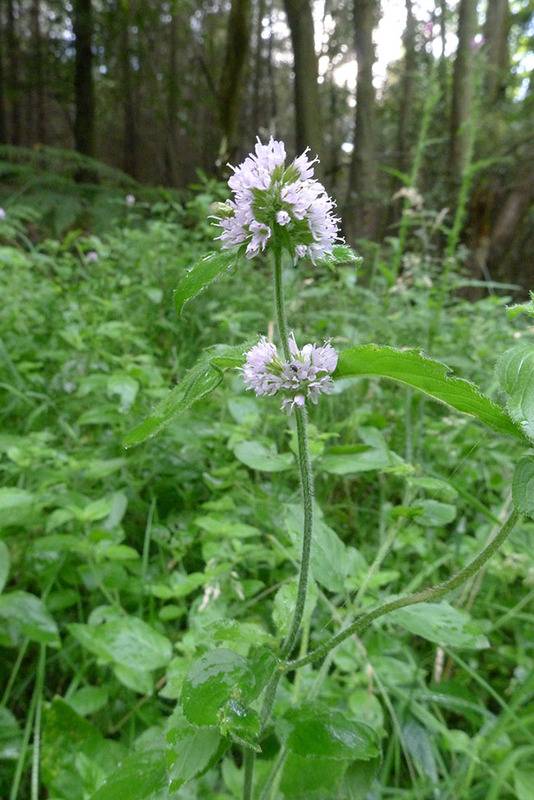 Water Mint, Mentha aquatica, growing in damp woods, East Sussex, August. Photo: Paul Kirtley. Water Mint, Mentha aquatica has a wide distribution across Europe (except the far north), Asia and Africa. 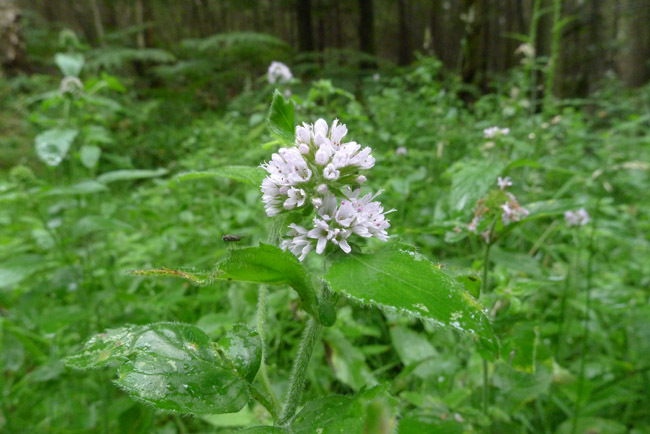 It is the most common of the wild mints in the British Isles but is much less frequent in Scotland than elsewhere. 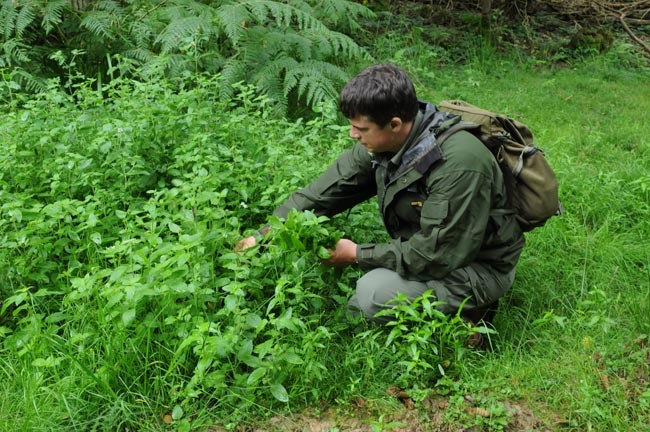 It has a number of food and medicinal uses and is therefore a useful plant to know for foragers and those interested in bushcraft and survival. Water Mint, as its name suggests, likes to grow in very damp ground and, unlike some similar mints such as Corn Mint, Mentha arvensis, will grow in ground submerged in fresh water. Hence, Water Mint is commonly found on the banks of rivers and ponds, on the edge of and in the shallows of streams, around and within marshes, fens and wet woodland. Where it grows it is often found in quantity, particularly in shady, damp woodland. If you inadvertently crush underfoot even a lone plant, you will certainly smell its fresh minty aroma. Apart from its easily recognisable smell, Mentha aquatica shares some common traits with other mints. Like many members of the family Lamiaceae, Water Mint has a stem with square cross-section, and opposite pairs of leaves alternating at 90 degrees to the pair above or below on the stem. Water Mint, Mentha aquatica, leaf detail. Photo: Paul Kirtley. The leaves themselves are oval, toothed and are attached to the stem by a short stalk. 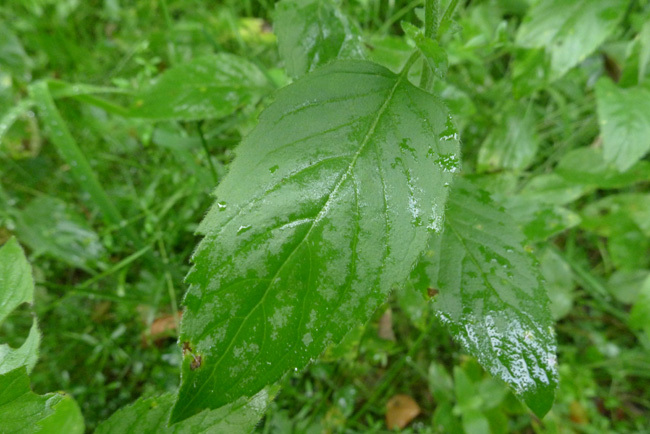 The leaves typically have 4-6 arched veins. The stems and leaves can show some red-purple colouration, particularly earlier in the year. The plant grows erect but the height of the plant varies considerably from 15 to 60 cm (6 to 24 inches). The upright stems can range from being almost hairless to covered in soft, downy hairs. The leaf margins can also be hairy. Water Mint, Mentha aquatica, flower detail and leaves. Photo: Paul Kirtley. Water Mint flowers in mid to late summer (July to October in the UK) and the species is characterised by having most of its flowers towards the top of the plant. The flowers are pink-lilac in colour, tiny and clustered in dense whorls. In addition to flowers clustered around the joint where leaf stems and main stem meet (the leaf axils), water mint has a terminal whorl of flowers at the top of its stem (unlike Mentha arvensis which has only axillary whorls). Water Mint, Mentha aquatica. Note the square stem, alternating opposite pairs of leaves, axillary and terminal flower clusters. Photo: Paul Kirtley. 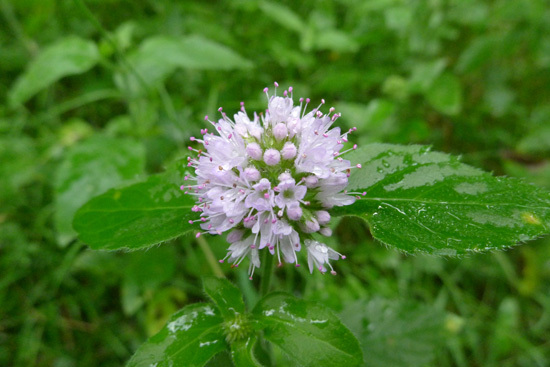 Water Mint contains a lot less menthol than Peppermint, Mentha x piperata, but it has been used in a similar way to calm digestive disorders, flatulence and nausea. Indeed on one occasion when I had a very sore stomach with food poisoning, I used Mentha aquatica to sooth the stomach cramps I was suffering. The author collecting Water Mint, Mentha aquatica. Note how abundantly the plant is growing. Photo: Amanda Quaine. Whether you are using it to settle your stomach or just in need of a refreshing drink, fresh Water Mint makes a very pleasant and flavoursome tea. To make a couple of large mugs of tea I generally collect a medium-sized bunch of water mint from the upper parts of plants. I pull off the leaves and put a handful in each mug. 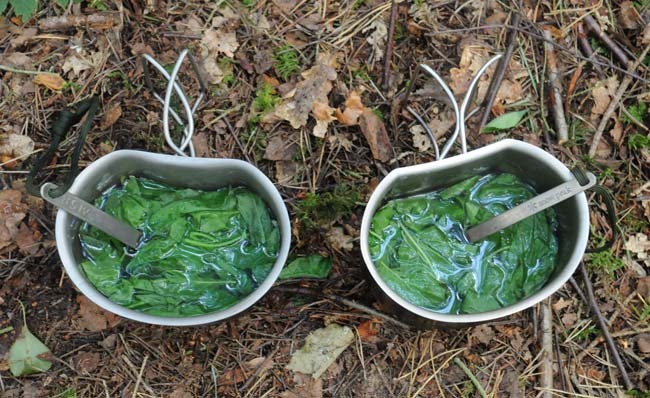 Then cover the leaves with water that has just boiled. By the time the drink is cool enough to drink without scalding your mouth, the leaves will have steeped sufficiently to provide a good flavour. If you have a sweet tooth, you can always add a bit of sugar if you have some. Fresh mint tea, made with Water Mint. Photo: Amanda Quaine. Mint has to be one of my favourite herbs. Sugary mint tea takes me back to my honeymoon in Morocco! I am sat here having read you article being able to taste the mint, going to have to go on a hunt tomorrow! Good to see a feature on Watermint Paul. It does indeed make a refreshing ‘tea’ and I recall being very happy to see you appear bearing a big bunch of it on an unexpected overnight camp in Wales last year. On that occasion in we sweetened our brew with some smashed-up Kendall mintcake which gave us a fantastic boost. Finding something to make a brew from is very comforting when the tables turn on you, and fits in well with the ‘STOP’ drill, affording a few minutes of calm in which to get your head together and from which you emerge rehydrated and ready to take on the challenge in front of you in the knowledge that you’ve already improved your situation. I’ve since found watermint growing alongside a stream in the woodland where I volunteer and it is a welcome alternative to our standard brew kit during breaks. Nice to hear from you. It’s a really good point you make with respect to STOP. Having a brew often gives that breathing space to be able to Stop, Think, Observe and Plan. Some people will also use the time it takes to smoke a cigarette as thinking time. You only need a few minutes of calming down and clearing your head to be much more effective going forward. You use the word ‘comforting’ and I think this is a good one. I remember your super-mint tea of water mint and Kendal mint cake 🙂 You all seemed very glad to have had it. That or it’s a very reddish variety of Spearmint / peppermint! (Nitrogen or Phosphorus deficiency perhaps). Could I order some Menta Aquatica Lamiaceae from you?